Tonnes, grams and metres are unheard of at a hidden attraction in the north-west corner of Hove’s largest park. 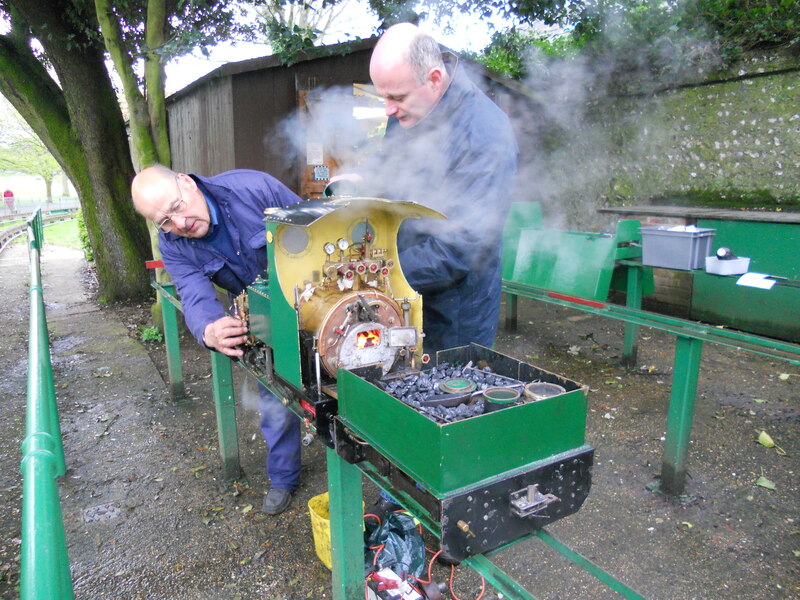 The Hove Park Railway is owned by the Brighton & Hove Society of Miniature Locomotive Engineers. This most British of organisations was formed in 1962 when a group of keen rail enthusiasts broke away from the more general Brighton & Hove Society of Model Engineers. An earlier, much shorter, incarnation of the railway was kept at Withdean Zoo (that’s another story) and consisted of 2.5”, 3.5” and 5” gauge ‘portable’ track, thought to have been constructed from redundant air-raid shelter steel. It was moved to Hove Park in 1951 and, after 500 passengers in around five hours, was an instant success. Another track was added in 1957 alongside the original which effectively doubled passenger capacity. Each was then extended to 270ft in 1958 and again, after the removal of 25 tons of soil, to 339ft in 1967. The circuit of today takes its form from the works of 1975 which saw the creation of a 2,000ft continuous track of 3.5” and 5” gauge with a loop at either end. But this was destroyed, along with hundreds of surrounding trees, in the hurricane of October 1987. Only the club headquarters, which had opened in June of that year, survived. A community project raised £13,000 for the most solid of replacement structures. Residents and businesses were encouraged to ‘sponsor an arch’, as evidenced by the plaques on the various concrete sections. The new track was opened in 1992 by the then Mayor of Hove, Cllr Mrs Arlene Rowe. I was told straight away about locomotives and carriages, tenders and tanks, boilers and batteries. Every guy has a serious passion for their hobby including Chairman Mick Funnell and enthusiast Colin Hancox. 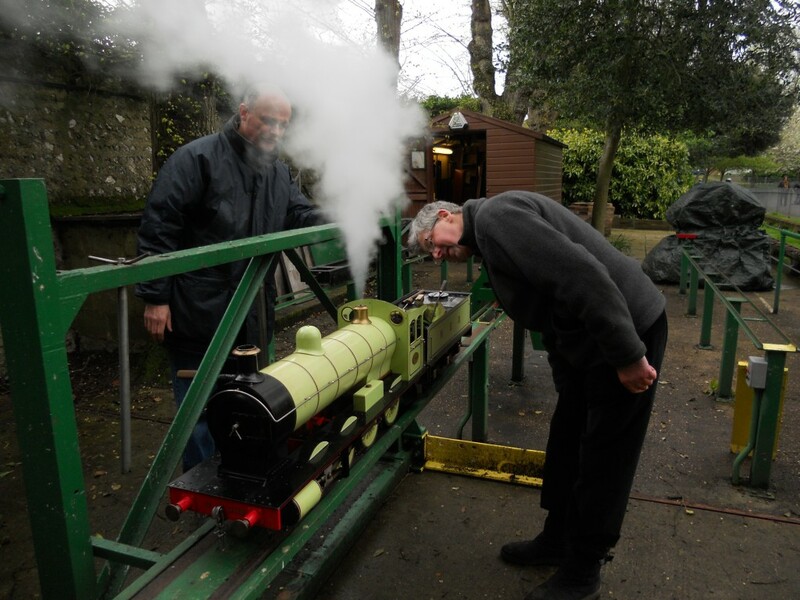 Michael Lloyd took time to show me his tender engine, one of two locomotives that he owns. Another member owns four. Peter French actually started a long career on the railway as a fireman aged 15. Bob said that he had been a member for around 30 years and then realised that he joined in 1962. Time flies, like the model trains. The Society will be celebrating its 50th anniversary in September but the busy Hove Lions Carnival on Monday 4th June comes first. Tickets cost 50p or £1, depending on the size of the kid. Euros are definitely not accepted.